The golden and multi color head piece adorned with stone work. This item in Anklets / Bands / Brooch category was first added to our catalog on 05-09-2013. Buy Multi color golden head piece, sold & shipped by The Elegant Store where you can shop online for Shop for Indian Jewelry, Accessories, Books & Organic Products. 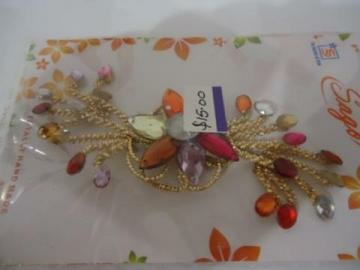 This Brooch, Pins & Bands collection has been tagged as bands, pins, accessories, indian jewelry.